You want a real fight huh? Then look to the East! If you go on to almost any boxing forum the world over you will find people bemoaning the lack of action in world title bouts, especially stateside. Bouts like Guillermo Rigondeaux v Nonito Donaire and Floyd Mayweather v Saul "Canelo" Alvarez, have been the most notable bouts to be slated whilst any bout involving Andre Ward and Bernard Hopkins have also come in for a hard time from those wanting to watch a war in the ring. With this in mind I've decided to give fans some recommendations of the top world title fights featuring an Asian from this last year. All of these fights have been in, or around, the highest level in the sport and all have genuine re-watch value thanks to the action and sheer violence of the fights. If you're sick of watching chess matches in the ring, these should keep you entertained, at least for a while. A front runner for Fight of the year, this bout saw two of the highest ranked Super Featherweights mixing it up in a bout that can only be described as special. 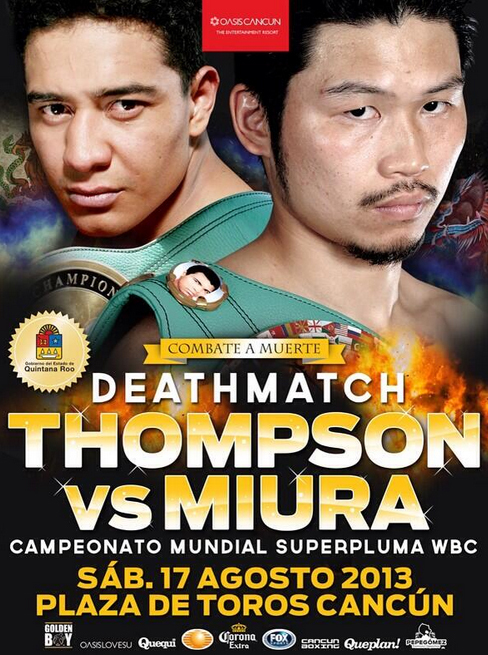 Miura, the defending WBC Super Featherweight champion traveled to Mexico as the under-dog to Mexico's very own Sergio Thompson. Miura knew that Thompson was dangerous with the Mexican having an early victory over Jorge Linares but yet knew he had to risk it all to take home a victory in Mexico. What we got as a result was unbridled violence, knockdowns, huge punches from both and pure unadulterated entertainment. If Mayweather, Ward, Hopkins and Rigondeaux play chess, Miura and Thompson played rock 'em sock 'em robots. Unfortunately for Miura this victory likely only earned him another hard bout with a strong rumour that he will be facing Takashi Uchiyama in his next bout. When a Japanese fighter travels to fight a Thai in Thailand for some form of a world title they expect to lose. It's not that they aren't good enough to win, but they just don't win. Well, they didn't until Koki Eto showed how it's done. Eto and former Light Flyweight world champion Kompayak Porpramook went at each other from the opening bell and refused to slow down until the final bell in a bout that may well have given us 8 contenders for "Round of the Year". Eto set off at an amazing pace and Porpramook tried to match him for much of the bout as both guys gave their all. Their was no thinking afterwards that "well he could have done more to win", in fact they had both gone to the well, taken the water and found a separate well to go to. As with the Takashi Miura fight above this one took place in Latin America with unheralded Filipino Merlito Sabillo traveling to Colombia to fight Luis De La Rosa, and just like Miura/Thompson is was a special back and forth battle. For 8 rounds the men traded leather with the fans standing and applauded both men. Despite the fact Sabillo was in a foreign country he was still getting his share of applause as the fans forgot their nationlistic bias and just enjoyed a genuinely amazing see-saw battle. Not only was the fight excellent from the off but the fight ending shot was a beauty as well. The fight put Sabillo on the boxing map and whilst he's never going to be the next Manny Pacquiao he's a fighter who has been getting plenty of attention since the victory. Unfortunately De La Rosa looked like a broken man in his follow up fight losing to Moises Fuentes inside a round. What can you say about this one that HBO didn't say for us? It was Provodnikov's first fight at world level and yet left him as one of the sports must watch fighters. His up coming fight with Mike Alvarado is another sure fire hit and win or lose that we're sure that boxing fans will be put on the edge of their seat from the opening bell. It's not often that a fighter makes fans in a clear loss but that's what Arakawa did. He was dropped several times, hurt in almost every round yet refused to quit and gave the fans an incredibly memorable fight on Showtime whilst also giving Omar Figueroa a chance to show that he is more than just a powerful an hard hitting kid. Arakawa hasn't fought since though we'd love to see him given another world title opportunity in 2014. Heart is something a fighter either has or they don't. In this memorable Cruiserweight clash Denis Lebedev proved he had the heart of a lion as he fought on with a totally disfigured and swollen face before his gas tank eventually gave way against Guillermo Jones. The bout, for the WBA Cruiserweight title was not brutal with both men landing bombs but also gruesome due to the swelling of the Russian. Whilst not a total war like some of the others the WBA Minimumweight title fight between Ryo Miyazaki and Jesus Silvestre turned out to be a brilliant contest in it's own right. Miyazaki, fighting with cuts around both eyes was perhaps fortunate to claim the victory though the fans were the real winners in a bout that was genuine engaging from the off. It was third time lucky for Katsunari Takayama who finally managed to claim the IBF Minimumweight title. The Japanese fighter had to really put it all on the line and it showed at the end of the bout with Takayama bloodied, swollen and looking like a man who had truly been in a fight, yet he also looked like a man who was very happy with his nights work. Although he was dropped in round 3 he was in control of the bout and knew it in the later rounds as he started to show bout, topping off a marvelous performance. Returning to the world stage after more than a decade out Malcolm Tunacao gave Shinsuke Yamanaka a really tough battle despite being dropped several times and bloodied. The bout showed what the Bantamweight division had in both the power of Yamanaka and the grit and determination of Tunacao who had waited a long time for a chance to call himself a two-time world champion. It not have been an all out "war" but it was an action packed and tough battle that should have fans tuned in throughout. When you have Akira Yaegashi in a bout you expect excitement and that's what we got here as he took the WBC Flyweight crown from Toshiyuki Igarashi in what was widely described as a "brutal" battle. Both men wore the scars of war come the final bell and with good reason as they had genuinely gone through a war with each other. Although the bout was a bit too one-sided overall the action spoke for it's self and gave us a very enjoyable encounter that was sadly missed by many fans the first time around.